Through PeaceJam UK, I work with young people on international peace education programmes to support them in becoming active citizens and advocates for peace, justice and human rights. Many of the themes of ThoughtBox support the work that is happening with PeaceJam and I support wholeheartedly all approaches to allow young people to become more compassionate and connected. 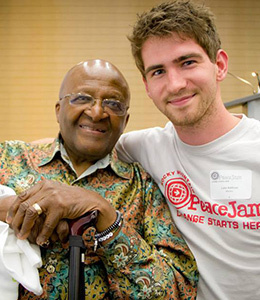 "PeaceJam was initially launched in the USA in 1996. Ivan Suvanjieff, an artist and musician, had been talking with some gang members in North Denver, when he discovered that these young men with guns greatly admired Archbishop Desmond Tutu for his non-violent efforts toward social change. He then realized that Nobel Peace Laureates could act as alternative role models for disaffected youngsters. His colleague, Dawn Engle, helped him contact the Dalai Lama, whom she had met during her years of work for the U.S. Congress. His Holiness loved their idea and helped them set up PeaceJam as a vehicle to enable his fellow Laureates to teach young people the art of peace. The UK has been part of this global network since 2006. The PeaceJam annual Youth conference was hosted for 7 years by the University of Bradford and its Peace Studies Department, and is now hosted by the University of Winchester. PeaceJam UK works with schools and youth groups all around the UK. More than one million young people worldwide have participated in PeaceJam educational activities and community projects through the One Billion Acts of Peace (nominated for the Nobel Peace Prize in 2015). PeaceJam has created thousands of new leadership and volunteer opportunities for young people. Evaluations have shown that young people who participate in PeaceJam programmes show statistically significant gains in academic skills and knowledge, as well as increased school and community engagement. Incidents of violence also decrease in schools and community-based organisations where PeaceJam programmes are implemented."